A fantasy romance inspired by the confluence of wistful time and divine place, Midnight In Paris finds Woody Allen at his best, crafting a love letter to a city rich with passion and history. Successful Hollywood screenwriter Gil Pender (Owen Wilson) still dreams of becoming a respected book author. On vacation in Paris with his fiancée Inez (Rachel McAdams), Gil finds himself inspired by the city's rich heritage and starts to muse about living there permanently, an idea that Inez dismisses. With Inez enjoying sightseeing and partying with pompous professor Paul Bates (Michael Sheen) and his wife Carol (Nina Arianda), Gil starts to take midnight walks on his own. He stumbles into an alternate reality of Paris in the 1920s, inhabited by the likes of F. Scott Fitzgerald, Ernest Hemingway and Gertrude Stein. They interact with him naturally, inviting him to parties and Stein even offering to review a draft of his novel. Gil moves back and forth between Paris of today with Inez in the daytime and the 1920s on his own after midnight, where he eventually meets Pablo Picasso's lover, the mysteriously attractive Adriana (Marion Cotillard). She is also seeking her true destiny in the company of her contemporaries, and an impossible romance flickers to life. Midnight In Paris celebrates the city's charming magic, and toys with the nostalgia of the past always glowing brighter than the reality of the present. It is among Woody Allen's best films, finding the sweet spot where his favourite themes intersect: troubled love enriched by an enchanting cityscape prompting an examination of a man's path in life. The opening montage, showing iconic Parisian scenes, noticeably lingers on for a good minute longer than the usual introduction, Allen sending the message that the city is one of his main characters. And throughout the film, Allen bathes the Paris of the past and the present, whether at night or during the day, with warm, comforting hues dominated by reds and yellows. Even the rainfall feels mild and soothing, while the numerous bistros emit an ever welcoming glow at all hours. And Gil is drawn into this mystique, finding in the city the perfect match for his romantic soul. Gil is most at home when walking the streets of Paris alone, and he gradually realizes that his connection with the city will define his happiness much more so than his relationship with Inez. Allen, who also wrote the screenplay, does not bother to explain Gil's frequent sojourns into the past, allowing the time shifts to be as natural as the human imagination. The theme, however, is clear. The glorious past is an inspiration for the present and the future, but pining to live there is an emotional cul-de-sac. The past is always the present for its generation, with the business of living and loving a constant and dominant requirement. Wistful sentimentality is what yesterday feels like, but only from today's vantage point. 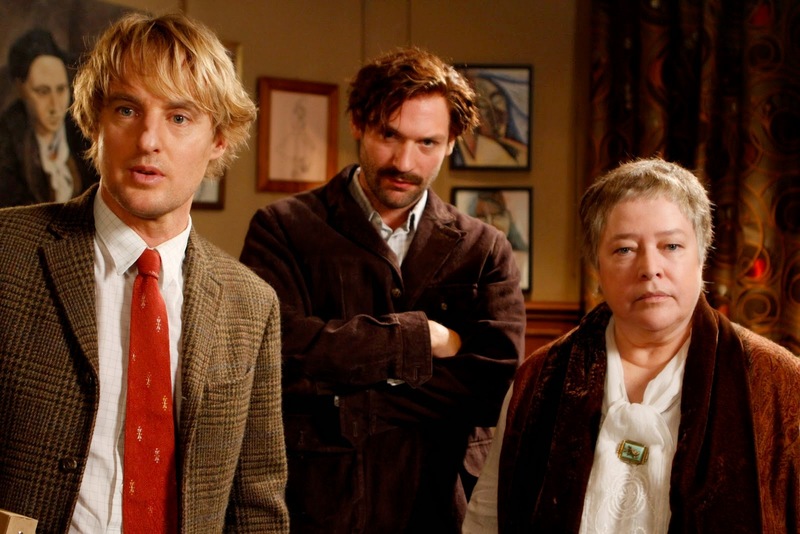 Midnight In Paris is populated by a perfect cast, Wilson creating in Gil an articulate man still seeking his place in life. McAdams breaks away from her traditional perkiness to provide Inez with a pushy edge, a modern woman trampling over her man's tender vulnerabilities. Marion Cotillard ghosts into the movie as Gil's muse, his most direct expression of love for the past, and also the signpost for the future. Michael Sheen, Carla Bruni and Léa Seydoux have small but memorable roles in Paris of the present, while Adrien Brody (Salvador Dali), Kathy Bates (Gertrude Stein), Corey Stoll (Ernest Hemingway) and Tom Hiddleston (F. Scott Fitzgerald) have a ball bringing the past to life. Picasso, Toulouse-Lautrec, Gauguin, Degas, Matisse, T.S. Eliot and Luis Buñuel are other celebrities of previous eras that cross paths in the dreamy mists of the night. Embroidered with delicate humour, Midnight In Paris is a whimsical masterpiece.